If you are under investigation or have pending or current court proceedings we appreciate that you are already under a significant amount of stress, worry and pressure. Accordingly, our initial advice is FREE and can be obtained either by phone, by e-mail or on some occasions by face to face interview. Contact us by calling 01208 75085, 24 hours a day 7 days a week or fill out the contact form on the right of this page. Once we have dealt with your initial enquiry we will be able assist you in deciding whether you need further help from us beyond our initial advice and whether this advice can be covered via legal aid or will warrant you paying for it privately. Legal advice and representation for someone attending at the police station as a volunteer or under arrest is FREE and is covered via the legal aid scheme. Legal advice and representation at the Magistrates Court and the Crown Court may be covered via the legal aid scheme. This is dependent upon the case meriting the grant of legal aid and for a case dealt with in the Magistrates Court you passing a means test. With respect to legal aid in the Crown Court you may have to pay a contribution to that legal aid if it is granted and if it is believed you can afford to pay towards the costs of your defence. We will advise you on the likelihood of you being granted legal aid and complete the appropriate application forms with you. 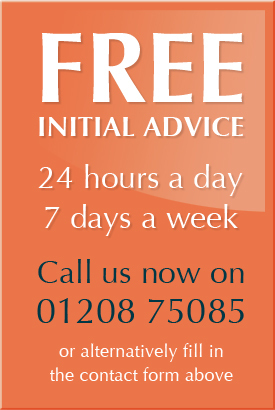 For FREE initial advice by calling 01208 75085 24 hours a day 7 days a week or fill out the contact form on the right of this page. If your case is not eligible for legal aid or you do not wish to apply for legal aid we can provide you with a quote for representation on a private fee basis. We are aware that it is very important that you know at the outset how much it will cost you for us to represent you. Accordingly, we will if you prefer provide you with an agreeed fee quote for our services in respect of investigations away from the police station and for cases in the Magistrates Court. The only additional costs that could be incurred would be for disbursements such as obtaining the appropriate expert report and travelling and VAT (where appropriate). The advantage of a fixed fee is you have the comfort of knowing how much it will cost you irrespective of how long the matter takes to conclude or indeed how much work we undertake upon your behalf.